In addition to the beautiful presentation and fairly easy prep work, this pork was delicious! The pork was flavorful and tender and the pureed pan sauce was perfect. Confession of a *wannabe* foodie… I am paranoid to serve under-cooked meat, but I am also paranoid to serve overcooked meat. Use a thermometer to keep an eye on the internal temperature of the pork and trust that the pork is done once it reaches 140 to 145 degrees F.
Arranged the pork crown roast in a roasting pan large enough that the meat does not touch the sides. Generously sprinkle the roast with salt, including the sides. In a small bowl mix together the finely chopped garlic, rosemary, sage, thyme, red pepper and olive oil. Coat the roast with the with the herb and olive oil mixture (including the center). Arrange the garlic, diced vegetables, and bay leaves around the outside of the roast. Pour 4 cups of chicken stock and the wine over the vegetables. 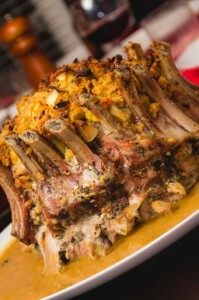 Stuff the top of the crown roast with your favorite stuffing. I highly recommend the Cranberry, Apple and Cornbread Stuffing. Insert a meat thermometer into the thickest part of the roast and place the pork in the oven. Cook for 30 minutes, then turn the oven down to 325 degrees F and cook for an additional 2-2½ hours, until the internal temperature of the pork reaches 140-145 degrees. Remove the pork from the oven and carefully remove the roast from the pan (a sturdy spatula and tongs worked well). Place the roasting pan, with the remaining vegetables and pan juices, on the stove over medium high heat and bring to a boil for 5-10 minutes. Blend the remaining sauce until smooth and season to taste with additional salt and pepper.